Young Rembrandts franchise business opportunity. Free Young Rembrandts business franchise information. Since 1988, Young Rembrandts has been experiencing steady growth and continual success. 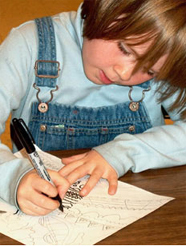 We offer the premier instructional drawing program for three to 12 year-olds. Our art education methodology focuses on fostering children's overall brain development. Current market trends show increased demand for after-school programs, and child-related services. Parents and teachers understand the value of enrichment and its positive impact on children's lives and academic performance. Our proven business system can be applied to any market territory with an expanding product line, and classes can be held at a variety of facilities, from schools to camps. Being a Young Rembrandts franchise owner means you have the freedom and flexibility of being your own boss, working in a home-based setting. You'll enjoy corporate support in every aspect of your business. Best of all, you will have the opportunity to positively impact the lives of young children, and your community. Love what you do for a living! Build positive relationships in your community, teach children life-long skills, and enjoy personal freedom and financial rewards. Instruction on setting up classes in schools, day-care centers, recreation centers, etc. Young Rembrandts offers you a way to positively impact the lives of children through art, while enjoying the rewards of being your own boss. "I left a successful corporate career to start my Young Rembrandts franchise—and I have never looked back! In fact, I am the envy of many friends and past coworkers; they say that they can tell I love what I do because I'm always bragging about my students!" - Laura D, Young Rembrandts Franchisee, Gold Coast, Chicago Illinois. You'll enjoy personal freedom in this rich and rewarding career. To learn more about the Young Rembrandts children's franchise opportunity, simply complete the form below.